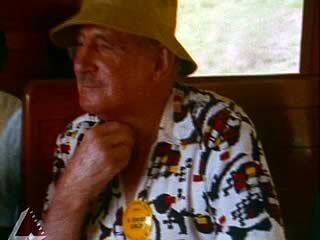 Video clip synopsis – Weary Dunlop and his elderly comrades return to the site of the Thai-Burma railway. As prisoners of war they each had to dig three cubic metres of earth a day, virtually with their bare hands. Broadband MP4 hellfire_bb.mp4 (8.1MB), suitable for iPods and computer downloads. Return To The Thai-Burma Railway is an excerpt from the film Hellfire Pass (55 mins), produced in 1987. Hellfire Pass: More than forty years after the notorious Thailand-Burma railway was completed, a group of Allied ex-servicemen, including an Australian contingent lead by Sir Edward “Weary” Dunlop, returned to Hellfire Pass in Thailand to dedicate a monument to the thousands who died during its construction. Hellfire Pass is a Film Australia National Interest Program. 5.2 assesses the impact of international events and relationships on Australia’s history? In 1942 more than 20,000 Australians, together with large numbers of British and other allied troops, became prisoners of war after the fall of Singapore to the invading Japanese. For the next four years most of these Australians were held at Changi prison, in difficult conditions. Some were sent to Japan to work in coalmines, and many were sent to work with other Allied soldiers and local conscripts on the building of a railway between Burma and Thailand. 330,000 worked on the line including 250,000 Asian labourers and 61,000 Allied prisoners of war, 12,000 of whom were Australians taken form Singapore after the surrender. It is thought that about 90,000 of the 250,000 labourers form Malaya, Thailand, Burma and India died, together with about 13,000 Allied prisoners. The building of the railway involved 415 kilometers of clearing ground in the jungle cutting through hills of rock and builing bridges. There were 4 million cubic metres of earth to be moved, 3 million metres of rock to be broken and shifted, and 14 kilometres of bridges to be built. There was virtually no machinery available — only a few elephants and a lot of men with basic hand tools. The short timeline meant that men had to be worked hard to complete their tasks. Camps were set up along the route and men had certain quotas to complete by set dates. For the Japanese, there could be no delays and no failure if they were to support their Burma army. The safety of their colleagues depended on building the line. The men who worked on the Burma/Thailand railway were appallingly mistreated, beaten, starved, denied medical supplies and forced to live and work in primitive and physically destructive conditions. A large percentage died during this experience. This video clip is a representation of an aspect of the Australian experience of World War 2. How does the extract tell you about that experience? This clip is part of a film called Hellfire Pass which documents how a group of Allied ex-servicemen, including Australians returned to Thailand to dedicate a memorial to thousands who died in the construction of the railway. Consider how the experience of working on such a project and seeing fellow prisoners of war dying on it impact on a soldier. Investigate via the internet, the oral history of an Australian who was a prisoner of war and a forced labourer on the Thai-Burma railway. Record some notes that will enable you to introduce this person to your classmates and inform them of his experiences.